We will assist our client in establishing priorities to separate “wants” from “needs” and how they will affect the overall budget. Using that information, we will determine the spatial requirements and interrelationships that will be used to design the project. We will develop our clients approved program into preliminary drawings. This will be the first step in taking the ideas from the programming phase, and turning them into defined spaces for the project. We will develop the approved schematic design drawings into building components. We will develop the design to finalize the appearance and materials to be used for the project. We will also work with our consultants to analyze the structural, mechanical and electrical systems. We will prepare construction documents including drawings with details and specifications that are fully coordinated between the various disciplines, for submittable to the governing officials for permit and construction. If the project is to be bid, we will assist the owner in preparing bid documents, selecting contractors to bid the project, responding to bidders questions, receiving and analyzing the bids, and make recommendations for awarding the contract. We will review shop drawings for implementation. We will monitor the quality and progress of construction through site visits and job meetings. We will review the contractors pay requisitions. 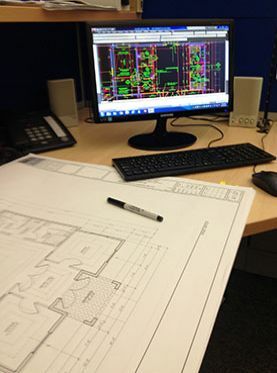 All of our projects are produced by our highly trained staff, using state of the art technology and the latest Computer Aided Design (CAD) software. Our documents are coordinated regularly through the internet with our clients and our consultants. This allows us to provide our clients with accurate design and construction documents in the shortest time possible.